Compared to the summer’s plush anime selection, Fall 2016's offerings are a little slim. We had Berserk, Orange, Mob Psycho 100, ReLIFE, 91 Days and other high-impact titles scattered across shonen, fantasy, shoujo and historical fiction genres. This season’s a little different. My top pics for this season are more about girls and female audiences. Kotaku East’s Brian Ashcraft wrote an exhaustive guide to current anime offerings. I’ve narrowed down the list to the five must-watch titles, which, after broad research, turned out to be on the shoujo, drama and magical girl side of things. Happy watching! Plot Summary: Koyuki Himekawa obsessively plays a mobile game in which she’s living her dreams of becoming a righteous, beautiful magical girl—until the game’s mascot offers to transform her into one IRL. Himekawa’s time as the magical girl Snow White is everything she wanted until the magical girl administration tells her and her peers that they’re cutting the number of magical girls in half. When the girls compete, things get dark. Why You Should Watch It: It takes cues from the brilliant (and dark) magical girl anime Madoka Magica. Its characters, setting and dialogue are all light and sweet, making the plot twists all the more gnarly—and the plot twists will have you screaming. This is a wicked, smart show that, like Madoka, bends magical girl tropes into devilish yanks at your heart. 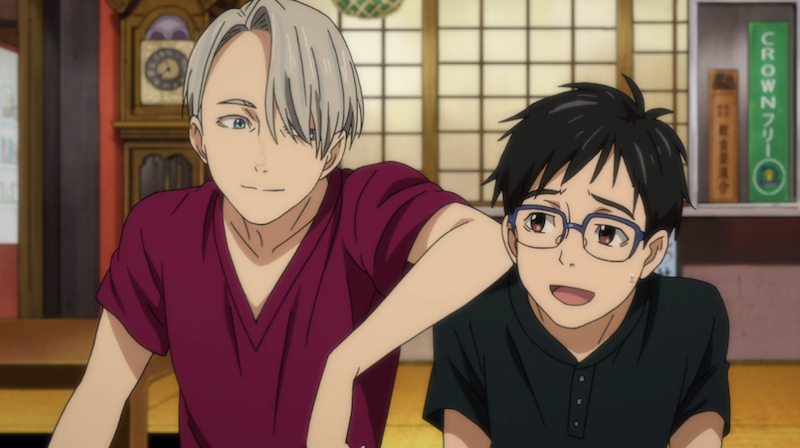 Plot Summary: Japanese figure skater Yuri Katsuki was still suffering from an embarrassing defeat at a Grand Prix event when Russian figure skating legend Victor Nikiforov learns of his skating potential. Nikiforov drops everything and flies over to Katsuki’s town to train him. But Yuri!!! on Ice is not just a sports anime. It’s the story of Katsuki and Nikiforov’s intimate, delicate and often sensual relationship as teacher and student. Why You Should Watch It: I have gone on the record describing this anime as “pretty damn cringe” and I don’t take that back. But anime fans are going crazy over Yuri!!! on Ice because it’s doing something different: depicting an emotionally complex (and occasionally raunchy) relationship between two men. It’s resonating with fans who have wanted homosexual overtones in a mainstream anime for years. Also, it’s proven wildly popular among professional figure skaters—so you know the show’s skating routines aren’t anything to sniff at. I’ll add that it’s directed by Sayo Yamamoto, who also directed Michiko to Hatchin, a celebrated anime about a Brazilian woman who escapes prison. Plot Summary: Diligent student Cocona encounters the wild shard-hunter Papika while she’s whooshing past on a hoverboard. Papika involves the unwilling Cocona in her inter-dimensional fragment hunts and, through time, they come to cherish each other’s eccentricities. Once they learn that Cocona’s childhood friend is also hunting for shards for a rival company, insane fights break out. Why You Should Watch It: I raved about this anime after its first two episodes, and after seeing a few more, I’m even more blown away by Flip Flappers’ ingenuity and charisma. It’s a story about female companionship and vulnerability, yes. But each episode takes animation cues from unlikely sources, like the psychedelic Alice in Wonderland or the post-apocalyptic Mad Max or Miyazaki’s Nausicaa. Not one moment is boring. Everything is high-tempo and maximum fun, generally without reverting to shallow attention-grabbing tactics. Plot Summary: During an alternate world’s WWII, the proud princess Finé 0f Eylstadt struggles to protect her people from invading Germanian forces. Under near-death circumstances, she reencounters the witch Izetta, the last-known descendant of a famous witch and a childhood friend. Izetta devotes herself to protecting Finé, who will do anything to save her country. Why You Should Watch It: The animation quality is phenomenal. Airplanes and tanks are rendered with impressive precision. Izetta is also crazy suspenseful, making me hold my breath throughout the show’s well-choreographed fight scenes. It’s a classy anime, with interesting commentary on WWII and strong female characters—despite a first-episode shower scene. Plot Summary: High school girl Kae Serinuma is a rabid boys’ love anime addict and grade “A” otaku. But once her favorite anime boy dies, Serinuma locks herself away for days in mourning and, in the process, loses dozens of pounds. When she emerges, four of her male peers face off to date her. It turns out that she’s less interested in their advances than she is in seeing them kiss each other (or keeping up with her favorite boys’ love manga). Why You Should Watch It: This one’s definitely a guilty pleasure. But it’s a top-form shoujo. It will make you laugh and blush and grin stupidly at work, if you’re me, and you’re watching shoujo anime at work. It’s exciting to follow Serinuma engaging with hobbies like soccer once she climbs out of her otaku shell a little. And her passion for anime (including soccer anime), which horrifies her suitors, actually gives her real-life reference points for real-world experiences she’d never had before. The real pull, though, is watching the boys fall in love with her because she’s a rabid “fujoshi,” and not despite it. It’s not great that the boys only notice her romantically after she losses weight, but I like that they’re turned off when she pretends to be a normal hot girl instead of her true, weird self. Let me know your top five must-watch anime of the season in the comments!